Finally, time for an update…this time to Photoscan Professional 1.1.6. In this tutorial, I am going to fly through the basics of getting a Photoscan project up and running without getting to deep into the details. If you are interested in the details of specific tools, I will refer you to the official documentation (Agisoft Photocan User Manuals). I also have discussions on cameras and camera geometry. Photoscan also has a tool, “Estimate Image Quality”, which can take some of the guesswork out of large datasets. Load your photos, select all of them, right-click on one and choose “Estimate Image Quality”. Switch to the ‘Detail’ view in the Photo pane to see the quality score from 0 to 1. I have found that images with scores less than 0.6 are good candidates for removal (the documentation says less than 0.5). Removing photos is a bit of a double-edged sword. If you do not remove poor photos, you risk getting incorrect alignments and by removing photos, you risk not getting a complete alignment. The hope is that your photoset has sufficient overlap to mitigate the effects of a few missing photos. If you have a synced GPS track for you photos, use a program like GeoSetter to geotag your photos before processing. With geotagged photos, the coordinates are usually Lat/Long (in degrees); use the convert tool in the “Reference” pane to convert to UTM (or your coordinate system of choice). Never use geotagged photos as the sole source of georeferencing information. The error in consumer grade GPS units (handheld, in-camera, or UAS) is not sufficient for anything more than helping with photo alignment. Reference: If your photos are geotagged, this will use the GPS positions to speed up processing. Key Point Limit: 40,000 is default. Smaller numbers of key points can speed up processing, but you run the risk of not having enough points to align photos. Tie Point Limit: 1000 – 2000 is recommended. This is one parameter to play with if you are having alignment issues. You can even take it down to zero to have no limit. Constrain features by mask: If you have created masks on your photos, use this option to limit the point search to just the areas you selected. After the initial pass of photo alignment, there may be photos that are misaligned or unaligned. You can force the program to try again, usually this works (but not always). If that does not work, select a smaller batch of problem photos and try again working in small batches. Open the aligned photos and find features that are in both images and right-click on the aligned image and select ‘Create Marker’ to place a temporary marker in the image. Do that for 3-4 features. Once you have created a marker in one image, switch to the second aligned image and use the ‘Place Marker’ option in the right-click menu. Open the misaligned image and place the markers on the features. 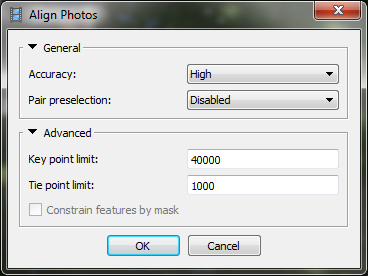 Then you can select the misaligned photo(s) and run ‘Align Selected Cameras’ again. ** If the markers do not seem to be helping (one-by-one), you can try to realign all the images. Either by selecting all your photos and selecting “Reset Alignment” then “Align Selected Cameras” OR by running the Align Photos tool again. MAKE A COPY OF YOUR PROJECT BEFORE YOU DO ANYTING DRASTIC LIKE THIS. If none of that works, there is not a whole lot you can do but disable or exclude the photos that will not align. Double-check your projection and vertical datum. Load your data points into Excel and delete all but the NAME, LAT(Northing), LONG(Easting), and ELEV fields to simplify things. Double-check the preview pane at the bottom of the window to make sure your coordinate are going to the right place (be careful…some GPS outputs are Y,X,Z instead of X,Y,Z). If you import a larger file, you should delete any points that are not present in the photoset. If you used geotagged photos select all of the photos in the Cameras section of the Reference pane and click the checkbox to “uncheck” all of the geotagged photos. If you do not do this, Photoscan will try to use both the geotagged images and the in photo GCPs to georeference. This can lead to some interesting results as the software tries to reconcile the less accurate GPS data with coordinates that are more accurate. Double-click the photo to open it, zoom in on the control point, right-click on the center of the control point marker, select “Place Marker” and select the appropriate marker. Find the next photo with the same GCP as the first, set the marker. Once you have a marker placed in two photos the software starts to guess where they should be in other photos. Right-click on the marker you have been working on, select “Filter Photos by Marker”. This will show just the photos that the marker is in. Go through all of the photos and place the markers. In the photos pane, select “Reset Filter” to get back to the full photoset. Double-check that all of the photos have little blue flags above them in the photo pane. The errors reported by Photoscan are the ‘root sum of squares errors’ and the ‘root mean squared errors’ for each point. *** These values are only valid for the GCPs and should not be reported as the accuracy of the entire model. To judge the accuracy of the model I highly recommend that you collect independent control points that can be used to compute the overall spatial accuracy of the model. 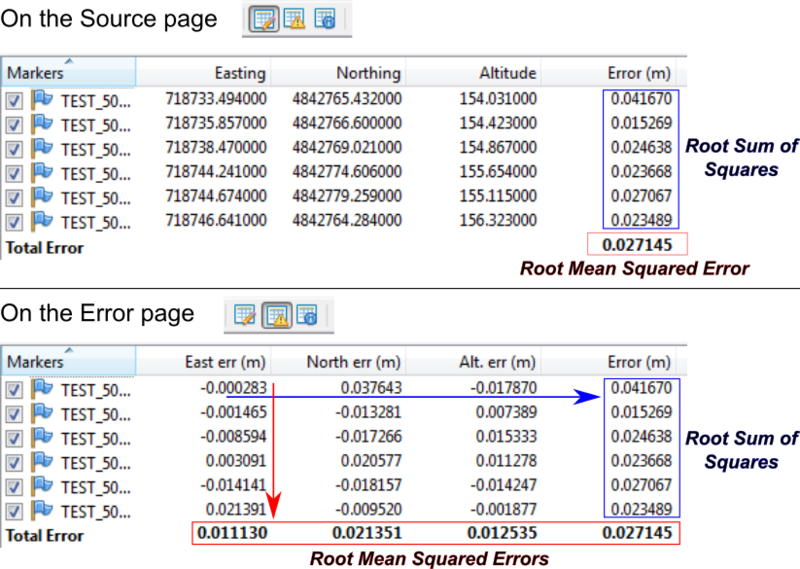 Please refer to the ASPRS POSITIONAL ACCURACY STANDARDS FOR DIGITAL GEOSPATIAL DATA for details on accuracy assessments. Ultra High: I have only ever tried this once and my computer run out of memory. This is the super memory intensive part of the process, photosets that are large (lots of photos) can take a long time to complete. Too many photos cause the program to run out of memory. The quality that is achievable and the time it takes depend on your processor (CPU), RAM, and video card (GPU). Depth Filtering: Aggressive (default), limits points that are too far from the surface. For some vegetation applications, this may need to be relaxed a bit. Use the “Rectangle Selection”, “Circle Selection”, or “Free-from Selection” tools on the toolbar to select and delete errant points. Photoscan has a tool to automatically classify the point cloud into “ground” and “non-ground” classes (similar to lidar data). You can also select points and manually assign a class. For geography applications, a height field mesh would normally be modeled orthogonal to the Z-axis of the coordinate system. In Photoscan, the height field is actually modeled against the orientation of the bounding box (the light gray box with a red bottom) of the model. You can run a Python script (**Align Bounding Box Tool**) in the console or from Tools > Run Script… to align the bounding box to the reference coordinate system. There are some other fun scripts there too. Height Field: only builds a mesh surface orthogonal to the reference system Z-axis (i.e. no undercuts will be modeled). This is the fastest mesh procedure and excellent if DEMs are going to be your final product. Arbitrary: Will model every nook and cranny of the object. Best for oblique imagery, when point clouds or complex mesh surfaces are going to be the final product. Polygon Count: The number of polygons that the model will be decimated to after processing. Extrapolation: will interpolate the surface and then extrapolate out to fill the bounding box. 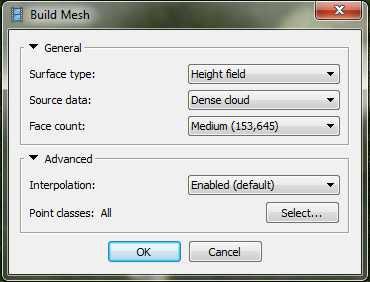 If you used it to classify the dense point cloud, you could specify which point classes you want use for the mesh. This step is not totally necessary, unless you will be exporting the 3D model (as a PLY or OBJ) to a 3D graphics program. I will give the settings I use the most here; there are tons of other options. If you are interested check out the user manual. Adaptive Orthophoto: I recommend this mode for most 3D models that you will be exporting. It gives the best results for Arbitrary meshes. 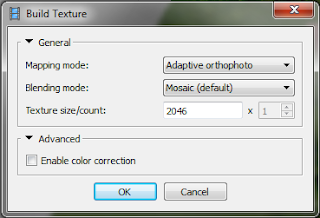 This determine the resolution of the texture map. Higher means better resolution, but also increased file size. The default is 2046 and I usually double that to 4092. I usually leave this unchecked. From the File menu, you can export the sparse or dense point clouds. I recommend that you export in the LAS format, keep the coordinate system that you georeferenced everything in, and keep the default export parameters. For super big point clouds you can enable the ‘Split in Blocks’ option to tile the point cloud. 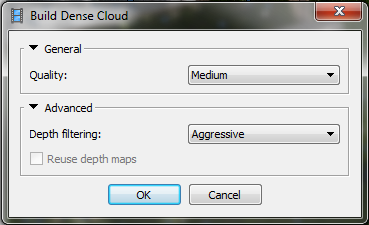 If you are taking your orthophoto outputs into ArcMap (or any other GIS/RS software) there are some settings that Arc will default to that will make the orthophoto way to bright. Great article. Thx for sharing. One of the best informative article i have found ever for the photoscan. It's a very helpful website! I'm very pleased to read this article! I'd like to thank you as well! Viewing the Agisoft's web site, tutorials, and help files was not getting me the aid I needed in referencing my GCPs. Your article walked me through it much better than theirs. Thanks again. It's a very helpful tutorial! Keep up the good work, thanks! When generating orto rher are 2 options. One planar and another in geographic. Whats the diference and whats the use for both? hi can you explainn me what mean XY error ? and why agisoft conbined X and Y in one Error ? Has anyone had issues with their exported DEM while trying to work with it in ArcGIS? I am unable to create a Hillshade from my DEM TIFF.